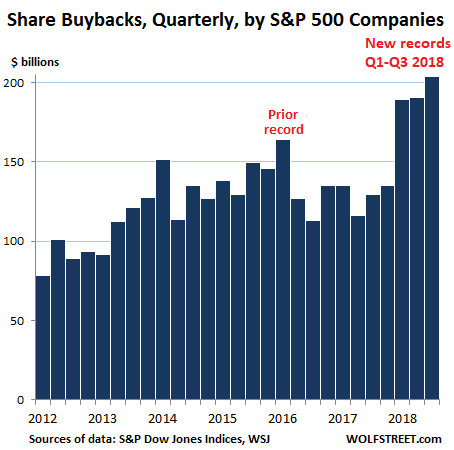 These share buybacks were funded by debt issuance and by cash, including cash that had been registered “overseas” for tax-avoidance purposes, where it was invested in US Treasuries, US corporate bonds, and other bonds. The new tax law allowed companies to “repatriate” this moolah under tax-advantaged terms. And companies are doing this. For example, we have been seeing for over a year that US Treasuries held in tax havens for Corporate America, such as Ireland and the Cayman Islands, have plunged. So, companies are selling these securities registered in accounts overseas and are using the proceeds to buy back their own shares. The effect on the economy is nil, but it was hoped that it would pump up share prices, and it did for a little while, but now the opposite is happening. Alas, since the end of August, it seems, as companies have been buying back their own shares, just about everyone else has been selling them. The fourth quarter is still not finished, and shares still have a few trading days left to get creamed further, and Q4 share buyback totals won’t be known until March. But given the 34% surge in share buybacks so far this year, Q4 share buybacks are likely to be another doozie. At the same time, so far in Q4, the S&P 500 index has dropped 12.6%. So, following that logic to its conclusion: Let the shares plunge all the way; it’ll save our buyback queens some serious money. If it were just that simple. 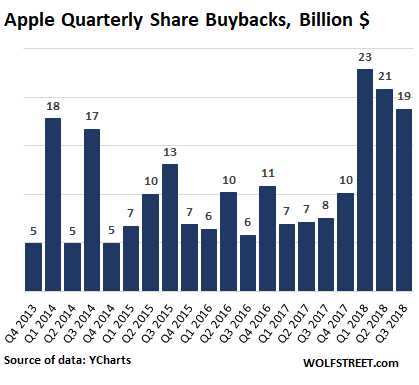 The number one share-buyback queen in Q3 was Qualcomm [QCOM], which blew $21 billion on buying back its own shares, the third highest amount for any company in any quarter in history, according to S&P, behind only Apple’s share buybacks in Q1 and Q2 2018. Qualcomm’s stock price has dropped 23% since September 14. 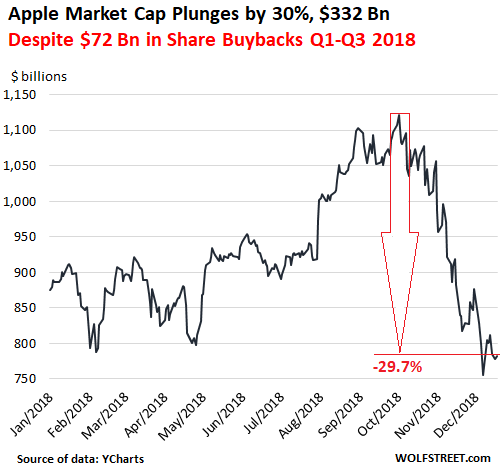 The number two share-buyback queen in Q3 was Apple [AAPL], which blew $19 billion on share buybacks. 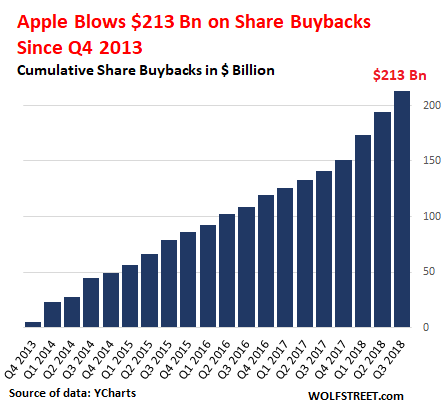 This brings its share buybacks for Q1 through Q3 to $72 billion. Apple’s stock price has plunged 28.4% since October 3 (data via YCharts). This is the vengeance of share buybacks. They accomplish absolutely nothing productive. But they waste huge amounts of money – likely over $700 billion just in the full year of 2018 and $3.5 trillion since 2012 – that could have been used for productive purposes, such as inventing new things, building new plants in the US, and the like. Share buybacks are a product of financial engineers. They’re designed to tweak earnings per share (by reducing the share count), create market hype and buying pressure to drive up the share price, fatten executive compensation packages, and overcome the dilutive effects of stock-based compensation and M&A. And since a good portion of them have been funded with debt, leading to record indebtedness and deteriorating credit quality of Corporate America, they will also contribute to real existential problems, such as those that GE is struggling right now. This entry was posted in Business, Debt, Economy, Financial markets and tagged Apple, Share buybacks, stocks. Bookmark the permalink.